Paleo-Future reader artbot recently turned my attention to the monowheel, the awkward contraption featured on the 1932 Popular Science cover on the right and the photograph below. Sometimes the promise of the paleo-future can give us all wonderfully hilarious visuals such as the excerpt from Wikipedia featured below. It gets us acquainted with the dangers of "gerbiling." "In most designs, if the driver accelerates or brakes too hard, it is possible that the force applied overcomes the force of gravity keeping the rider at the bottom of the wheel, sending the rider spinning around the inside of the wheel. This is known as gerbiling, because it has some similarity to the situation of a gerbil running too quickly inside of a hamster wheel." 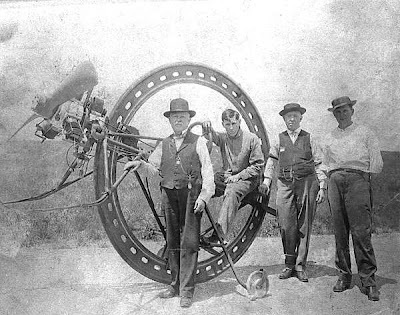 For more great monowheel pictures, (albeit none with gerbiling), check out this site. Buy it right off the rack ... c'mon, you got to say that looks like a hoot. Those wheelsurf guys *finally* took my artwork off their site. They used it w/o my permission and then offered to sell me one of their vehicles at cost as "payment". Not really worth it since they were in Brazil at the time and shipping would have been $2000.